To celebrate the best day of your life, we’re offering elopement wedding packages to make your wedding plan easier. 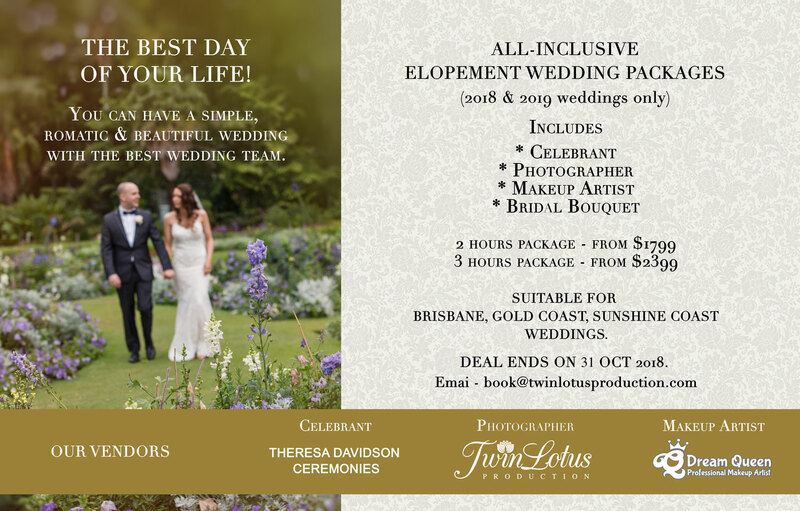 You can have a simple, romantic and beautiful wedding with one of the best wedding team in Brisbane. Our all-inclusive wedding packages include Celebrant, photographer, makeup artist service and one free flower bridal bouquet. Enjoy the one-stop shopping experience. Service areas cover Brisbane, Gold Coast, Sunshine Coast. Traveling fee might be required for some areas. Bridal makeup and hair styling with Dream Queen Professional Makeup Artist for the bride and one bridesmaid or mum of bride. High-resolution edited images in deluxe custom packaging. These images will also be supplied at a low-resolution for the internet. 8’x8′ wedding album with 20 pages. The special offer will end on 22nd Dec 2018. Subject to availability. Traveling fee might be required. To secure your day, please contact us today.